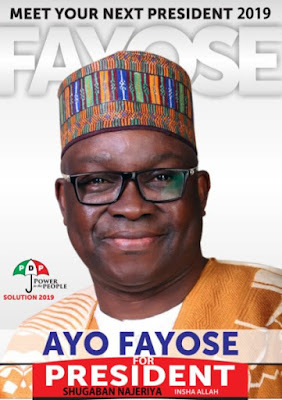 Ekiti State Governor, Ayodele Fayose, on Thursday formally declared his intention to run for president in 2019 on the platform of the Peoples Democratic Party (PDP). Fayose said he will run a purposeful government that will cater for all Nigerians irrespective of religion or tribe. He lamented the state of Nigeria and urged the party to support him become the country’s next leader. “I welcome you all to this historic event, which is landmark in the political landscape of our country, Nigeria.